It is the year 2016, and every sports fan knows that means one thing, Olympic Season preparations are underway. One particular event that has always been associated with the Olympics, especially with the inauguration ceremony, is the marathon. The story behind the marathon is quite interesting, too. aid. And thus, the modern day marathon was born. As demonstrated above, marathons are no walk in the park; they are possibly the most grueling physical events an athlete can undergo. So without further ado, let’s take a look at the 5 most difficult ones a runner could tackle. This event is usually held in the months of June, July or August in San Francisco, California. The Wall Street Journal called it “the race all marathoners fear.” Although the route runs at a total of 26.2 miles, the biggest challenge will be the gargantuan hills that are a prominent feature of ‘Frisco’s topography. The sudden elevation changes mean that the times will be a lot slower as the runners struggle through the steep course. 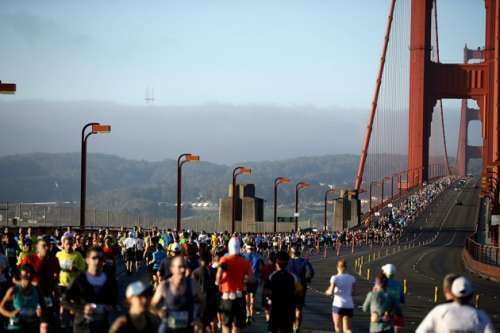 On the bright side, beyond the 6-mile marker, one can take in the marvelous views of the city as they run towards one end of the Golden Gate Bridge and double back again. Also provided the runners have any breath left, the views from the hills can be breathtaking.